Joe Maneely is one of those comic book creators that I think a lot of people don't know, but still has an incredible reputation among pretty much everyone that does know him. That's undoubtedly at least partially because of his incredibly short career (he died when was only 32) but I think also partially because he died in 1958, just before comics started to take off again. In fact, nearly his entire comic career -- between 1948 and 1958 -- occurred during one of the most depressed points in the industry. He started in comics working for Street & Smith, initially working on largely forgettable characters like Mario Nette, Roger Kilgore, and Ulysses Q. Wacky. He also did work for Hillman Periodicals and George A. Pflaum's Treasure Chest. He then started doing work for Timely/Atlas, beginning in late 1949 with a story for Black Rider that didn't see print until 1950. He quickly became friends with editor-in-chief Stan Lee, and was brought in on a staff position around 1955 where he co-created the Black Knight, the Ringo Kid, the Yellow Claw, and Jimmy Woo. Maneely was pretty universally considered exceptionally talented. Herb Trimpe has said, "his pencils [were] almost nonexistent; they were like rough, lightly done layouts with no features on the faces ... It was just like ovals and sticks and stuff, and he inked from that. He drew when he inked. That's when he did the work, in the inking!" (You can see some of that in the photo I've included with this post.) Stan Goldberg noted, "Joe wasn't just a great craftsman; he worked so fast and he was one of the few artists who could go from drawing the Black Knight to drawing Petey the Pest, or a war story. He had an unbelievable knack..." And while admittedly known to hyperbolize, Stan Lee went so far as to say, "Joe Maneely to me would have been the next Jack Kirby. He also could draw anything, make anything look exciting, and I actually think he was even faster than Jack." Due in part to his friendship with Lee, Maneely would almost assuredly have had a hand in crafting the Marvel Universe had he lived even just a few more years. 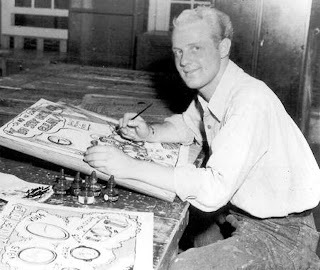 I've seen several people suggest that he would likely have been more instrumental than Jack Kirby, as Lee would likely have given him projects like the Fantastic Four, Thor, and Hulk at the outset. They've suggested that Kirby got those gigs in large part because Maneely was no longer around. That, of course, is speculation since Maneely died tragically in 1958. He had spent an evening dining with artists George Ward and John Severin, and got on the train from Manhattan to New Jersey to head home well after midnight. Having lost his glasses the week before, he evidentally had difficulty seeing clearly as he walked between two of the commuter cars and fell onto the tracks. He was later found still holding onto his portfolio. It was, by all accounts, a very tragic end to a very talented, if short, career. But his talent is worth remembering, even if the characters and stories he created haven't been made into blockbuster movies. There was no equal to Kirby in the states. I have a lot of doubts how well Maneely would have worked with the Marvel style. So I'm inclined to wonder.... If Maneely didn't die when he did, would Lee still have hired Kirby? And if so, who would have lost work? If Maneely hadn't fallen off a train, it seems that Kirby wouldn't have been needed at Goodman's company. I don't think the "Marvel style" that we know would have existed in the way we know it without Kirby. Look at the early Marvel comics Kirby didn't draw. Maneely was certainly a tremendous talent (just look at The Black Knight) but he wasn't Kirby.